The simplest + easiest ways to make lasting change in your life is to create the habit of a daily gratitude journal … and it takes less than 5 minutes a day. 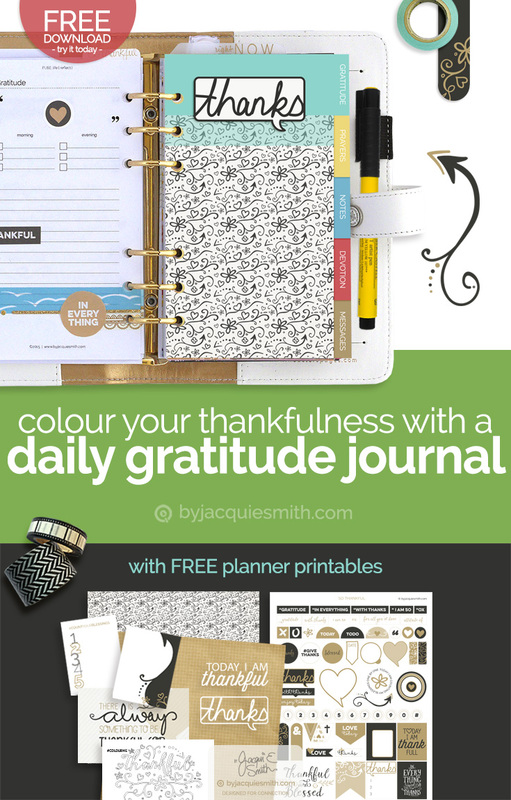 Create the habit of a daily gratitude journal + colour your thankfulness! Time seems to pass by quickly each year. One day rolls into the next and the next and well, you know how it is. I’m sure your life is similar in that way to mine. Before we know it we’ll be back into preparing our Christmas shopping list and wondering where the year has gone. It is especially true when you have a season of exceptional circumstances that require a lot of your time + attention. And caring for loved ones isn’t something we despise. We do it with heart. Even with the greatest of love we need to remember to fill our tanks too. We need to take the time to deposit into ourselves so we have plenty to give from. And to keep that tank topped up. It can be difficult to find a few moments to yourself each day. Unless you are purposeful and schedule some time each day, well, we both know it doesn’t just happen. There is more to you than just getting things done. You just need 5 minutes each day to create that lasting change. This is one of the best reasons to let the “planner bug” bite. Think of it as an investment in your health + wellbeing. Colour your thankfulness … create a daily gratitude journal in 3 simple steps! Let’s start creating your daily gratitude journal with the free planner printables and your favourite planner binder. 2. Print a handful of the pages to get started. You can print more as you need. 3. Trim the pages if needed, hole punch + insert into your favourite planner binder. # Tip: See my article for tips on printing your planner pages in 3 simple steps. You will need a few moments in your morning and evening routine to use your daily gratitude journal. I like to do this at breakfast time and then just before I go to bed. Think of gratitude being the bookends to your day. 1. Take one minute to list three things you are thankful for in the morning and another minute to write down three in the evening. It’s simple and doesn’t take a lot of time, yet is it very powerful in developing your gratitude muscles. By taking these few moments in the morning and evening you will naturally begin to see things to be thankful. It gets easier. You will find more moments to treasure. As you build this simple activity into your daily life you will find your outlook change. Even if your circumstances haven’t changed all that much, life will start to look different. What we focus on we find more of. 2. The second part of counting your blessing is to expand your thoughts on one of these items in the note space on your planner page. You can either do this in the morning or evening. It shouldn’t take you more than three minutes. I have seen things in my life change simply because I started being purposefully thankful. Rather than focus on the things that irritate me about someone, I use that space to exand on what I can be thankful for, their positive qualities. Making a purposeful decision to find things to be thankful about a person has changed my attitude + actions toward them. This has resulted in a postive change in that relationship. I don’t mean that you should choose to use positive thinking instead of confronting a situation. But if you first take action on shifting your perception + attitude, you will be in a better position to find new solutions, and even see clearer at what the problem may be. It works the same with circumstances that aren’t exactly the way you would like them. Becoming thankful for what is good, helped me change my attitude and I discovered other options I didn’t realise were possible. I like to say it clears the fog. Having a habit of using a daily gratitude journal moves my mindset from one of being negative or a victum of my situation, to one of hope + possibility. It moves me into a place of creativity and one where I’m ready for new opportunities + possibilities. If there is something that you feel needs more than one day to focus on, then stay with it until you feel it is time to move on. It’s not about finding the most amount of things to be thankful for, rather focus on creating a deep appreciation that will flow through your life + have positive effects on those around you. If you miss a day, just get back into it the next day. We are going for a lifestyle change, something that is worth taking the long view, and it is worth it. There are more benefits that you can imagine by cultivating the habit of using a daily gratitude journal. With your daily gratitude journal in action, you may be ready to add some colour to your thankfulness. You can do this in whatever way you desire and with whatever crafting supplies are your favourite. As you add some creativity to your daily gratitude journal, you will create a wonderful planner full of memories to inspired you when the challenging days come. Washi tape + planner stickers are all the rage right now. And they are a quick and easy way to add some colour to your pages. You may want to create digitally with some photos, quotes + bible verses. They would make a wonderful addition to your planner. There’s no wrong way to create your daily gratitude journal. Experiment with different crafting styles to find what works for you. And don’t feel like you have to get creative with your supplies everyday. Go where the mood takes you. Use your creative time to expand your thoughts + colour your thankfulness. The most important thing to remember in creating your daily gratitude journal is why you are doing it. Those specific reasons will be different for each one of us. The big picture however, is that you want + need to feel connected to your life. Not just go through the motions. Remember, there is more to you than simply getting things done. Taking time to connect with your life refuels you, and it takes no more than 5 minutes a day. It’s one of the simplest + easiest ways I know to make real + lasting changes in your life. Thanks for joining me as we create the habit of a daily gratitude journal + colour our thankfulness!